Naturally only a room which meets surgical requirements should be used as an operating room. 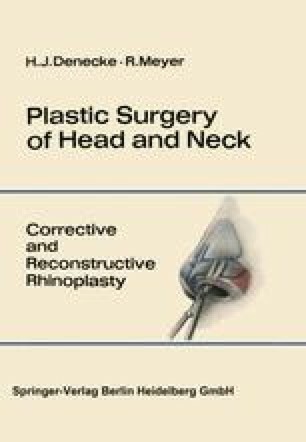 General requirements of equipment can not be discussed in detail here, since it would extend beyond the scope of this book ; they are discussed very well in the leading texts on general surgery. We refer hare to the general and specific surgical text by M. Kirscgner, Vol. I (Hegemann). — A smaller operating room suffices for minor surgery of the auricle and the nose. In major surgery a complete operating room should always be at one’s disposal. In plastic surgery of the nose, mouth, pharynx, larynx, trachea and esophagus, suction devices which function well are to be kept at hand for immediate use. Because of the illumination of the operative field with the headlight, rheostat, and adapter, sufficiently long electric cords must be available so that the surgeon can move freely at the operating table. Since many surgeons like to perform long operations on the head and neck while sitting, the operating table should be constructed in such a way that the surgeon’s knees will be comfortable as he sits at the upper end of the table. Tn addition, a hydraulically regulated seat with variable height is desirable for the surgeon in certain operations, especially on the trachea and esophagus. The same requirement also applies to the operating table, so that changes in the patient’s position are also possible, especially in surgery of the trachea. The operating room must be capable of being completely darkened, so that endoscopies can be performed at any time during the operations on the trachea and esophagus. Fluorescent lighting should not be used in the endoscopy room. Normal lighting provides instant light and shows skin color naturally. When using the headlight one works best in a half-darkened room.